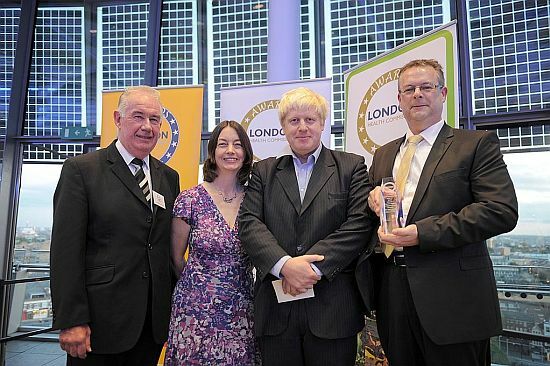 No good deed goes unnoticed, and that is certainly the case of some of our most committed and dedicated volunteers who have been given awards by British Cycling, the Prime Minister’s Office, the London Mayor’s Sports Awards – to name but a few. The time and effort taken to run and manage Slipstreamers is immense, as is the energy passion and enthusiasm of those who do so willingly; and so we are very proud to show off their successes! The 2017 Awards ceremony took place on 6 November 2017 at City Hall. All shortlisted nominees and award winners were joined by Team London’s celebrity ambassadors and VIP guests in an inspirational event. Head Coach Dave George was shortlisted in top 3 finalists for 2017 Children’s Coach of the Year. At a rather fancy evening event in London, Dave and Claire enjoyed an evening of glamour and celebrity. Dave didn’t win a trophy, but he is most definitely a winner every day with the impact he makes on our members! Thanks to British Cycling who nominated us, we were shortlisted in the top 3 for the Mayor’s 2017 Team London Sports Award. Unfortunately, we didn’t win, but we enjoyed an evening of truly inspirational stories of the work of volunteers across this great city. Plus, big highlight for our Young Volunteers in attendance was meeting Dame Barbara Windsor, Christopher Biggins and Dr Alison Mowbray! Community Sport and Recreation Awards showcase the positive impact of grassroots sport and recreation in local communities. The awards have been celebrating grassroots sport and recreation for over twenty years, and champion grassroots work on a national scale, using examples of best practice to drive positive, societal change. At a fabulous event in London on the 14th July 2017, we were presented with the Community Sport and Recreation Volunteering Award by HRH The Earl of Wessex. Young Volunteer Anastasia did us very proud by introducing the club to the guests and talking to HRH in person about the work we do. Read all about why we have been honoured with this award on the Sport and Recreation Alliance website here. Read the British Cycling coverage of this award here. This award acknowledges those who have demonstrated active involvement in their youth centre or wider community. Awarded to Sam Grant at the London Youth Awards evening on 23rd March 2017 for his contribution to his club and the continued impact he makes towards developing young people. More details of the awards handed out are here. Read Sam’s reflections, presented to an audience at Buckingham Palace, on his time at Slipstreamers, here. The Outdoor Education Award is for organisations that have gone above and beyond the ordinary in their dedication to getting young Londoners involved in outdoor, environmental or adventurous activities. Awards will be given to those who have demonstrated a high level of commitment, progress and ability in these areas. This was awarded to our club at the London Youth Awards evening on 23rd March 2017 for work in delivering opportunities that promote cycle sport and enjoyment of the great outdoors. Particular impact of the Summer 2016 Parklife project on the wider Hillingdon community was recognised, as well as the Young Leaders aged 14-24 who managed this project in its entirety. More details of the awards handed out are here. More to follow. Read about Dave’s experience here. More to follow. Alison’s report of her day here. At an award ceremony in Hillingdon on the 28th January 2015, the Mayor of Hillingdon presented awards to sporting individuals who have excelled at their chosen sport or made a real difference to a local club or team in the London Borough of Hillingdon – click here to find out more. Head Coach Dave George was nominated by the club to receive this award. Click here to read our report on this. 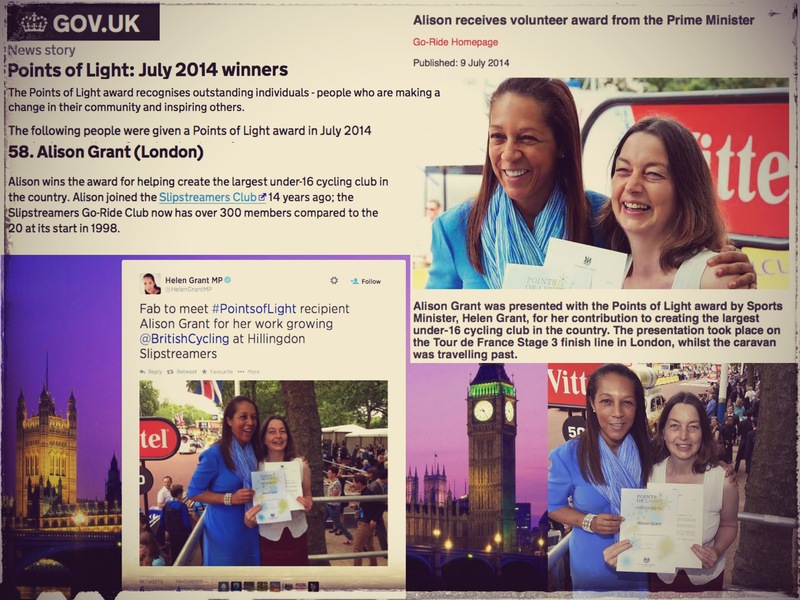 Alison Grant was presented with the Points of Light award by Sports Minister, Helen Grant, for her contribution to creating the largest under-16 cycling club in the country. Alison, who is Club Chair and Club Welfare Officer to name two of her many roles at the club, is the latest recipient of the Prime Minister’s Points of Light award, which recognises outstanding individual volunteers, people who are making a change in their community and inspiring others. Click here to read all about this is our news hub. Following nomination by British Cycling for Children’s Coach of the Year , John Gunn won his category at the event on the 3rd December 2013. The UK Sport event honours sports coaches and coaching organisations who have demonstrated outstanding success over the previous 12 months. Hosted by sports coach UK, the event is seen as one of the most prestigious within the industry. Slipstreamers were presented with the award in a ceremony at the City Hall for our contribution to health and well-being. Brian was crowned the UK Participation Coach of the Year at the 2010 UK Coaching Awards. This award acknowledges Brian’s efforts with Slipstreamers, as well as his tireless work nurturing the skills of young people using British Cycling’s Go-Ride programme at Field End Junior School, and women and girls through Minet Ladies Cycling Club.